Voicebox: Opera in Concert has closed its 2015/16 season in grand style with the world premiere of a new Canadian opera, Isis and Osiris, Gods of Egypt. 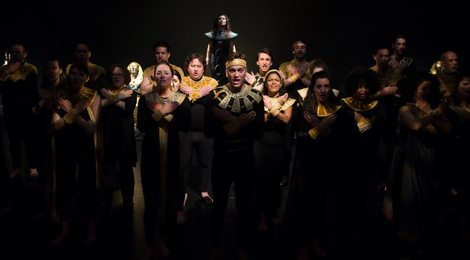 The opera, based on the central story of Egyptian mythology, is composed by Peter-Anthony Togni to a libretto by poet Sharon Singer. Togni’s music transports the audience to a unique soundworld that is somehow both ancient and modern, secular and religious at the same time. Singer’s libretto ably captures the drama of the story that will later have echoes in Greek mythology and the Bible. The biggest surprise for an audience expecting the work to be presented in concert is that it turned out to be fully staged with a set, costumes and lighting cues. The opera concerns the four children of the earth god Geb and the sky goddess Nut. These are Isis (Lucia Cesaroni), Osiris (Michael Barrett), Seth (Michael Nyby) and Nepthys (Julie Nesrallah). Crucial for understanding the story is that the four have taken on mortal form in order to rule on earth. They may have supernatural powers but they are also subject to death. Isis and Osiris, co-rulers of Egypt, are happily married and are awaiting the right phase of the moon to conceive the child Horus, who will become the patron god of Egypt. Seth and Nephthys, however, are unhappily married, Seth having always coveted Isis for his wife. the indomitable Isis sets about to gather the fourteen pieces to reassemble Osiris so that she make use her powers to resurrect him. The myth of Isis and Osiris contains elements found in myth and legend all over the world. Seth’s jealousy and murder of his brother is analogous to the story of Cain and Abel. Osiris’ dismemberment and resurrection is like that of Dionysus in Greek mythology. Isis’s search for her dead husband is gender-reversed parallel of Orpheus’ journey into the underworld for his dead wife Eurydice. As for opera we should remember that in Mozart’s The Magic Flute, Sarastro is the chief of the priests of Isis and Osiris and prays in his aria, “O Isis und Osiris, schenket der Wahrheit Geist dem neuen Paar”, that the two gods will grant the spirit of wisdom to the new couple. Dealing as it does with one of the ur-myths of the world, the opera could hardly have a more important subject. How did evil come into the world? Why does life seem to be a battle between chaos and order? Is there a reward for virtue? It’s fascinating to see this subject dramatized and surprising that no one has attempted it before. Isis and Osiris as it now exists shows that Togni and Singer on well on the way to creating a work that could enjoy wide success. That Act 2 is much more effective than Act 1 points out what elements need to be emphasized and which de-emphasized. In Act 2 the action is much more compact and there are a greater number of lyrical moments, moments of reflection and self-analysis that seem to inspire both Togni and Singer to do their best work. Isis’s aria upon learning of the death of Osiris is stunning and Seth’s declaration of his intent to do evil is like a powerful new version of Iago’s “Credo” in Verdi’s Otello. The resurrection scene is filled with verbal and musical surprises. And the piece ends on a marvellous note (actually a chord) of unresolved ambiguity. In contrast, Act 1 tends to be too processional and too didactic, especially about aspects of ancient Egypt that do not move the story forward. Singer’s notion of beginning with a formal ceremony that is interrupted by disobedience is a good one, one that Shakespeare uses in Richard II and later in King Lear. In both cases we know that order is being disturbed irrevocably – in the first case by the king himself, in the second by the king’s youngest daughter – but Shakespeare does not go to great lengths to explain what the nature of this order is. The same could be true of Isis and Osiris except that the lecture about the Egyptian concept of ma’at goes on too long and is is repeated too often. We need know only once that the guiding principle of Egyptian life is ma’at – the confluence of truth, justice, morality and order – not several times. In terms of plot, the act has unnecessary scenes. After Seth declares his intention to kill Osiris and then invites him to hunt, we naturally assume that Seth will kill him then. When that does not happen, we wonder why the scene was there. The character of the disgruntled Grand Vizier (Singer’s invention) is also unnecessary. Seth’s is evil enough he hardly needs anyone else’s help to carry out his plan and Osiris does not have to be drunk for it to work. Torturing the Grand Vizier in Act 2 to find out where Osiris is is unnecessary because the unrepentant Seth is so willing tells everyone what he did. The best scenes in Act 1 are those that focus on the feelings of the characters and that advance the plot. A fine example of the first is the lovely aria Togni gives Osiris where he reaffirms his love for Isis. An example of the second is the tension-filled scene where Seth lures Osiris into the sarcophagus which closes the act. and modern at once. There are other effective moments, usually used as interludes between scenes, when the orchestration drops from eight members to a traditional string quartet. Then his music takes on the quality of Britten’s string quartets. Yet, there is no denying that his gift for melody which shines every time Singer’s libretto allows the characters pause for reflection. The duet of reunion of Isis and Osiris is exquisite with Osiris singing in falsetto to Isis’s soprano. His melodies also allow the voices to soar, often testing the highest notes in the upper range of the the singers. Often one wished that these lyrical sequences would last longer than they do, mostly because they stand out so much from the spoken dialogue and dullish slow-quick-quick-slow-quick-quick pace that takes over during choral narration or the dispensing of cultural information. The opera may be called Isis and Osiris, but there is no doubt that the star of the show is Michael Nyby as Seth. Every since Milton’s Paradise Lost (1667) people have noted that evil is more interesting than good, and so it is here. Singer’s Seth is a marvellous creation – like Milton’s Lucifer, who wonders why he has lost God’s favour, or like Cain, uncontrollably jealous of his brother. Nyby has the full measure of the figure with his mixture of hurt, malice, envy and later fear and defiance. His muscular yet agile baritone handles whatever difficulties the music casts his way with ease. And he so fully embodies his character that he becomes the focus of all eyes whenever he is on stage. Michael Barrett’s pure, English-style tenor is ideal for Osiris, an innocent, too trusting character. He well conveys Osiris’ sense of innate authority when he makes his proclamation at the start of the work and plays Osiris’ resurrection scene with such realism that we feel Osiris’ shock and pain at being confined once again in an imperfect mortal body. He can’t do much, however, to make Osiris seem less naive in hunting or drinking with a brother who has expressed such animosity toward him. a woman who grieves but who nevertheless forces herself into action. Her voice displays a wide range of colours but acquires a special mysteriousness in the sotto voce passages of the resurrection scene. Singer unfortunately does not give Nepthys much to do. Mezzo Julie Nesrallah plays her with dignity and suggests that the woman suffers from a hidden sorrow long before we realize Seth’s indifference. Nesrallah is assertive as the narrator of Isis’s deeds, but her character only has one moment to give us a glimpse of her personality when she sings to Seth of the love she still bears him despite his turning away. Since this is her single most lyrical moment in the work, one wishes it could have been expanded so we could hear more of Nesrallah’s lush, expressive voice. In smaller roles, Stuart Graham well plays the The Grand Vizier, a man whose grief had over time turned to bitterness. Christopher Wattam displays a fine, light tenor as the courier Imhotep, a character named no doubt after the famed Egyptian doctor of the 27th century bc. And Leigh-Ann Allen tossed off dazzling coloratura passages as the courtier Sennefer, likely named after a famed male noble who lived sometime during 16th to 14th century bc. The surprise that an opera in concert was fully staged at all was compounded by its being staged so well. On a minimalist set, Guillermo Silva-Marin choreographed complex processional patterns for the excellent 29-strong Opera in Concert Chorus and drew drew superlative acting from the entire cast. As the lighting designer, his use of a range of gobo patterns from natural to expressionist helped establish the changing atmosphere of the piece from order to disorder to a standoff between the two. The chorus was clad in black with golden usekh collars and belts while the four main characters wore robes and other period adornments to distinguish them in rank. Perhaps to underscore his wildness, Seth wore only black below-the-knee trousers sometimes with, sometime without an outer cloak. Robert Cooper lead the nine-member orchestra with precision and sensitivity through the varied and sinuous score. Isis and Osiris is one of the most promising new Canadian operas I have seen in years. The story is so essential and the lyrical material is already so appealing that revising the work to increase its lyricism and to provide more insight into its characters would open it to greater success. Riches are clearly there. All they need is more excavation to reveal them more fully. Photos: (from top) Christopher Wattam (centre) with Voicebox: Opera in Concert Chorus; Michael Nyby (standing) and Michael Barrett; Lucia Cesaroni and Michael Barrett; Lucia Cesaroni and Michael Nyby. ©2016 Gary Beechey.